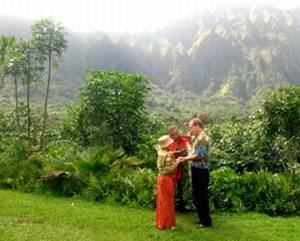 Your wedding will be a once-in-a-lifetime event if you choose a Hawaiian wedding officiated by an authentic Hawaiian Kahuna. Kahu Silva loves to launch your lives together with traditional Hawaiian chant and blessings. Say your vows together on one of the most beautiful beaches in the world, palms waving overhead, while fresh blossoms frame the shining faces of your wedding party. We can help you find the perfect location to say your vows. We know of many romantic outdoor locations where you will have a memorable wedding surrounded by the natural beauty of Hawai`i. Hō`ao is the ancient Hawaiian term used for marriage, which literally and very romantically means to “stay until the dawn.” The traditional ceremony known as ho`ao was a taboo or sacred ritual performed long ago only for the Hawaiian chiefly class or ali`i. It also refers to the night of the day called Huna, eleventh night of the month, when the ho`ao nuptials took place. Aloha is a word of many meanings including love, affection, sweetheart, loved one, beloved, kindness, tenderness, compassion, respect and admiration. Today, hoao is the weaving together of our authentic ancient and modern Hawaiian cultural traditions in the sharing of the eternal bond of aloha and all that it means. Kahu Silva has created several unique non-denominational Hawaiian wedding and vow reaffirmation ceremonies… a beautiful blending of ancient and modern Hawaiian wedding traditions and familiar Western wedding customs. The ceremonies can be adapted for Roman Catholic, Jewish and Buddhist faiths and are conducted in the Hawaiian and English languages and upon request, the Japanese language. The ceremonies can be traditional or contemporary, religious or non-religious, formal or informal in any setting of the couple’s choice. Where Can I Find Answers to My Wedding Questions? 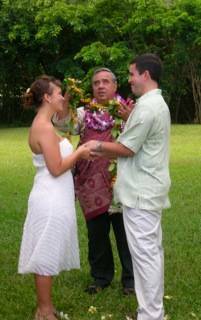 Most if not all of your questions are answered in our Wedding Ceremonies descriptions, and in our FAQʻs section. Use our Contact Us form for your wedding inquiry.